A few years ago, I've inserted the following Precautionary Note into Chapter 10C of Fritz Springmeier/Cisco Wheeler's on-line book , The Illuminati Formula to Create an Undetectable Total Mind Control Slave in a section that touched upon David Hudson and the promotion/use of mono atomic gold. Since writing that note, my concerns about taking mono atomic gold have only grown as I continue to stumble upon more and more indications that the entire promotion of mono atomic gold is an Illuminati deception. "Are we possibly dealing with a very long-term agenda somehow extending all the way back to the days of the Roman Empire -- and beyond?" [Readers should be aware that Anna Hayes mentions in her books that taking mono atomic gold is ultimately harmful. She claims that the initial growth of psychic awareness is not permanent, but rather levels off and later declines. Further, she says that the promotion of mono atomic gold is an Illuminati deception. While attracting the public with sugar plums of enhanced psychic clarity and improved health, the ulterior purpose of promoting mono atomic gold is to cause the destruction of the ten additional virtual DNA strands which all humans possess and which are now manifesting into 3D reality as seen with the 3, 4, or even 5 strands of DNA that now show up in the blood of Blue Indigo (Millennium) children. The destruction of the ten virtual DNA strands (unseen with 3rd dimension microscopes, but nevertheless still there in the higher 4th dimensional vibratory plane) prevents a human from activating these higher dimensional DNA strands and prevents access to higher spiritual awareness and telepathic abilities, as humans and mother Earth gradually increase our base vibratory frequency and ascend into the fourth dimension (a process that began in 1987 and will likely reach completion somewhere between 2018 and 2025). The activation of more than two strands of DNA is apparently necessary to exist in physical form in the fourth dimension. So now, the hidden purpose behind the promotion of mono atomic gold is perhaps becoming more evident: the Illuminati, the militarists, the satanists, the corrupt politicians, etc., and all those who serve the Dark Master, Lucifer, will not be allowed to reincarnate on a fourth dimensional Earth. One of the major goals of Alchemy was “The preparation of aurum potabile, liquid gold, a sovereign remedy, because gold being itself perfect could produce peffection in the human frame.” -quoted from The History of Chemistry as quoted by Manly P. Hall in his The Secret Teachings of All Ages, p. CLV. Gold has long been called the metal of wisdom by the Illuminati. The Illuminati are well aware of the alchemical quest to create the correct type of gold which will bring enlightment to the world. The Rabbi’s, who know the Cabala, have considered the secret of white powdered gold the greatest secret of all times. Somehow the Egyptian Pharaoh’s had learned the secret of how to make white powdered gold which when seen up close is transparent--like the gold described in the Bible as making up the streets in heaven. This gold is monotonic (with molecules in a high spin state), and looks like baking flour. It greatly enhances the pineal gland, and a similar substance of iridium greatly enhances the pituitary gland. Regular yellow gold or gold salts will cause the hair of the subject to fall out, but white gold is safe to ingest. After ingesting the white gold for over 9 months, a subject will become extremely psychic and disease free. The person’s body will also glow. Whether the Illuminati discovered this white gold, and have been using it secretly when their adepts went into hiding for months of long training, or whether they were only playing with substitutes we cannot say. (By the way, some occult groups groom slaves in the craft for 24 hours a day for a year.) At any rate, in recent years a man named David Hudson, who is of the Holy Blood line (13th Illuminati Bloodline, of the de Guise lineage), discovered and patented white gold. He named the white gold Ormus, which is the occult name for the Prieure de Sion. Ormus also pertains to Gnosticism in the ancient world. Ormus is also the Hebrew words for “golden tree”, which David finds appropriate since this white gold is the elixir of life that the sho-bread (& manna) was made from. This is said to be the reason the Priest glowed when he came out of the Holy of Holies, after eating the sho-bread. David Hudson, told co-author Fritz that he was supportive of the cabalistic goal of Adam Kadmon. Because Hudson knew the cabala very well, it seems likely that he understands what Adam Kadmon is really all about. Monarch slaves of the House of Rothschild have revealed how the Illuminati are able to do what they call Proxying. This is a Mind-Spirit transfer, done by the 1.twinning traumas, 2. channeling, 3. telepathic communication, and 4. astral projection so that all slaves worldwide are being pulled into one single interlinked Demonic One World Mind [this is the so called 'hive mind' characteristic of the Reptilian alien groups that dominate and interbreed with the human Illuminati..Ken Adachi]. We do not understand how white gold and iridium help the body become a semi-conductor so that the body is highly psychic, but it does. We hope to find out more. David Hudson has the patent (U.S. patent and some international patents) on white gold. There are a number of scientific studies on white gold which verify the power of white gold on the human body. When the co-author Fritz Springmeier talked to David Hudson, he certainly knows the occult world exceptionally well, besides being skilled in the Cabala. He claims he has nothing to do with the occult world, and that he stays away from the Illuminati. He says that he took what was occult and turned it into science. The co-author’s talk with him left many questions. David Hudson has given mankind the most important secret that has captivated the best minds of the occult world for centuries, the Quest for the Philosopher’s Stone. In view of the discussion in recent years in the alternative press and websites of the use of monoatomic gold for esoteric purposes by secret societies and shadowy military-industrial alchemists -- WELL -- please note the following research which involves the covalent bonding of gold nanoparticles to replicable DNA templates at Oak Ridge National Labortaories in Tennesse. Note the URL as well -- CESAR. Are we possibly dealing with a very long-term agenda somehow extending all the way back to the days of the Roman Empire -- and beyond? Who or what is the real power behind the the military-industrial complex and its many compartmentalized, high-tech projects? Are there currents and players in history that conceal themselves down through the millennia, but that have front personnel and agencies that they use to further their plans in every age?" 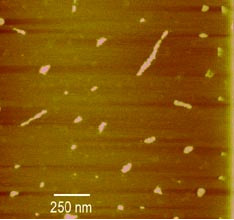 AFM images of thioctic acid-coated gold nanoparticles bound to ligated DNA on a mica substrate. Fig. 1: Typical products of the reaction between DNA and gold particles. The ability to assemble nanoparticles into arrays, networks, and circuits in a precise and controlled manner is key to the fabrication of a variety of nanodevices. Networks of nanometer-sized metal or semiconductor islands, or quantum dots, may exhibit a variety of quantum phenomena, with applications in optical devices, nanometer-sized sensors, advanced computer architectures, ultra dense memories, and quantum-information science and technology. The challenge is that fabrication with nanoscale precision of nanoparticle arrays in a time and cost effective manner remains a formidable task. Interest in the concept of self-assembled nanostructures led to the idea of using DNA as a scaffold or template for the programmed assembly of nanoscale arrays. DNA can be modified with functional groups at predetermined sites to allow for the attachment of other molecules in a specific manner. We have designed and demonstrated a new approach for binding nanoparticles to DNA. Functionalized nanoparticles are covalently bound to internal, chemically modified bases on double-stranded DNA without the presence of destabilizing "nicks" along the DNA backbone. In addition, we report an approach for thiolating one end of the DNA/nanoparticle product and attaching it to a gold surface. The ability to attach one or both ends of the DNA/gold complex, after generation of the desired pattern, to fixed contacts or electrodes is necessary for nanodevices fabrication. Fig. 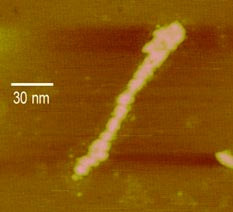 2: Close-up of DNA bound to gold particles. DNA oligonucleotides were designed with amino-modified bases for attachment to carboxylic acid functionalized gold particles. Two double-stranded DNA sequences were used for binding nanoparticles. Sequence 1 DNA was 22 base pairs long with two binding sites for gold per DNA molecule. The separation between gold binding sites was 3.7 nm. Sequence 2 DNA was 30 base pairs long, had one gold binding site per DNA molecule, and, after ligation, a 10.5 nm separation between binding sites. For AFM imaging, the DNA was ligated to produce longer molecules that would be easier to image. Gold nanoparticles with two different passivating coatings were tested. Particles with an average diameter of 1.5 nm were synthesized with a mercaptosuccinic acid coating, and particles approximately 2.5 nm in size were coated with thioctic acid Each particle has multiple reactive carboxyl groups on its surface. In order to decrease the probability for one particle binding to many amino groups on the DNA, methylamine was used to block some of the carboxyl groups on the gold. Methylamine was chosen for this purpose because of its small size and similarity to the methylene side chain containing the amino group on the DNA. The reaction between the amino group on the DNA and the carboxyl group on the gold particle was facilitated using a standard chemical method for joining carboxyl groups to amino groups. Analysis of the products by gel electrophoresis and atomic force microscopy (AFM) showed the gold particles bound to the DNA. In addition, absorbance spectra of the gold nanoparticles in the presence of DNA provide evidence of binding. This technique addresses a basic need to assemble nanometer-scale objects in a programmable manner and in a parallel fashion, from the bottom up. Research by K. A. Stevenson, G. Muralidharan, L. Maya, J. C. Wells, J. Barhen, and T.G. Thundat, Center for Engineering Science Advanced Research, ORNL; for details see "Covalent Attachement of Gold Nanoparticles to DNA Templates", J. Nanosci. Nanotech (submitted, 2002). The material that Hudson supplied to people contained about half a percent of ORMUS gold. The gentleman who fasted for 43 days and had the kundalini awakening experience did not take any pure ORMUS gold during that period. Much later he took "very little" ORMUS gold for "not very long". "According to the "Secrets of the Golden Flower", it takes 10 lunar months, which happens to be the same as the Egyptian's said, 9 solar months, same time frame, but at the end of this, at the ninth month, he literally becomes a light being. It's the breaking through of the cosmic egg, and he literally becomes a light being, capable of levitating and capable of bio-locating. To literally disappear here and reappear someplace else." Hudson suggested that this gentleman would become a "light being" if he continued to take the powder for nine months in his 1995 Dallas lecture. A July 27, 1996 interview with this gentleman revealed that he started the fast "About two years ago". At the time of the interview he said "I still take material but I don't take it in that volume". He also admitted that he had not bio-located. Despite these facts, David Hudson continued to imply that ingesting the white powder for nine months, after a forty day fast, would enable one to have some sort of ultimate transcendent experience. Hudson continued to imply this as late as his 1999 lecture in Dallas. When asked what had happened to the gentleman who had done the fast he said something like that the gentleman had quit taking the material before the nine months were up. "I knew what to do. But there are very, very few people who do. This takes place internally. It's an active process. You're not going to sit there and have this zip through you and all of the sudden these wonderful things are there. It can't be that way. That's not the way the circuit is set up in your system. Your chakras and realizations are not built that way. Nothing is built that way. And to expect something outside of that is absolute foolishness." People often mistake the signposts of psychic powers and kundalini awakening for the destination. In a sense, there is no destination since this implies an end of change. If someone gets to a psychic or kundalini awakened space and hangs there then they are clinging to the signpost and will not be able to proceed on the road as long as they are attached to the signpost. "Hudson's mind is not open to new ideas at this point, and he will stay like that for some time. Some of his associates can even be described as quite hostile towards my article, like the ORMEs-consumer interviewed on the moderated forum. Kundalini amplifies arrogance, just like everything else, and I find I still have problems with it myself, despite 7 years of steady work on it. One day, they will see it truly though." This "arrogance" is something that might reasonably be seen as a correlate of the development of psychic "powers" in advance of an expansion of one's heart in love. I see love as the connecting factor in All That Is. It is the universal quantum coherent glue, which binds us all together. I am sure that each of us can think of someone who has attained kundalini awakening or psychic powers yet her or his behavior remains aggressive and disrespectful. Both psychic abilities and kundalini awakening can be seen by the individual who achieves them as validation of their personal power to attract what they want. Their ego is fed by these things but their love suffers. "I have nearly completed my preparations, to make a personal physical transformation. Nothing quite like this has ever been done before, throughout the history of all past ages of man upon this planet, thus success is by no means assured. But, these are times without precedent, and when much is at stake, the risks and costs are correspondingly high. However, if like Jacob, I prevail with God, there will be a sign in the sky, beginning during that night separating July 3rd and 4th. The heavens shall then become red, like a refiner's fire, and you may safely watch this with everyone else. If this takes place, it will be explained as the Earth unexpectedly encountering and passing through a cloud of energetically ionized krypton gas; such is to be acknowledged, but is only a small, ancillary physical-level effect, and hardly the First Cause. I will meet with you thereafter." "The contacts that I have been getting from Gary have only intensified over the last few days, as I shared with you today. I feel there is a strong message here for all ORMUS seekers. Far from everyone's expectations, the ORMUS material may end up addicting if used carelessly and more "binding" rather than "liberating". It does not, in fact, produce any "release" from the cycle of birth-and-death. It only lifts what is normally dense - our embodiment, our mental and habitual tendencies - up to a notch, to what is less dense, or more subtle. The subtle qualities, as for example a kundalini arousal, a samadhi, or even a psychic faculty, are often aspired by everyone as indicative of "attainment". This could not be farther from truth. The Truth embodies everything, the subtle, the dense, and even nothing whatsoever. What is more dense - our reality - is not, in fact, one iota farther away from Truth, nor is the subtle any closer. "Going into the light" means going into another realm of phenomena, however subtle it may be. In this regard it is still a realm of illusion. It has not, in fact, transcended birth-and-decay. Even the complete destruction of ego, as Gary was often fond of saying, does not mean complete liberation. For, in the end, all of us still hold to a dharma, a truth, something to be expounded, a view. True liberation, the transcendence of it all, comes only when even the subtle views that we have of enlightenment, of each other, of a Truth however Universal it may seem, e.g., all this garbage that is our reality solidified, can be completely relinquished. By grasping so firmly onto fine points that discriminate this hypothetical versus some other hypothetical, one clearly demonstrates that in the end there is still a view, something that needs to be explained, some theory to be explored, some truth to be shared, some attachment that needs to be severed. This is all being written in fact for Gary's benefit and for anyone who thinks that ORMUS can bring short cuts." "Traditionally alchemists spent years preparing their students mentally for the internal application of such substances. Meditation, intellectual apprehension of divine process, a strict moral code and a deep understanding of self and the magickal nature of human relationships were considered necessary pre-requisites. I know from much personal experience that high end metallic preparations open ones mind to a vision of the true nature of reality very quickly. Most aspirants starting out on a spiritual path think this would be great - thinking that this process simply involves 'knowing cool stuff'. But the sad fact is that the Truth hurts, and the average seeker quickly discovers that they don't want the Truth and the "responsibility" that comes with it. Knowing the truth means acting in accordance with it or suffering the dreadful consequences. Until you understand how far away the average persons behaviours are from being productive - in line with the Truth - it is almost impossible to understand what I am suggesting here. In most cases arrogance will force persons forward and will have them taking powerful elixirs that in the last analysis will prove to be poisons for their unprepared systems. Alchemists did not just die from inhaling mercury fumes, or from lead poisoning. They also died from taking the actual Elixirs and the Stone itself ... because they were not sufficiently prepared." MSM and other sulfur nutrients appear to require an additional triggering factor in order to convert ORMUS to metal in the body. In the three situations that I know about the person was exposed to high energy electromagnetic forces in conjunction with the metallic gold fibers that came out of their skin. One of these people was Jim but another told me her story after hearing about Jim last November when I was in Australia. She said that she and a client also had gold fibers come out of her skin. When I questioned her about the circumstances she said that both of them had been taking MSM and had just been "treated" with an electromagnetic frequency device. I suspect that the extra electromagnetic energy breaks the Cooper paired electrons and that the sulfur gives them something to grab onto. I discuss this more thoroughly in my workshops but I have not taken the time to write it up before.